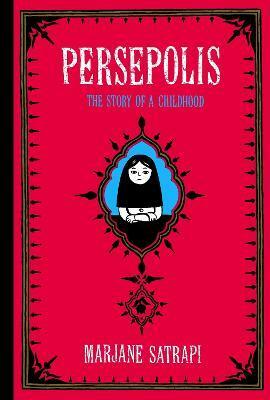 A Time Magazine "Best Comix of the Year"
A San Francisco Chronicle and Los Angeles Times Best-seller Wise, funny, and heartbreaking, Persepolis is Marjane Satrapi's graphic memoir of growing up in Iran during the Islamic Revolution. In powerful black-and-white comic strip images, Satrapi tells the story of her life in Tehran from ages six to fourteen, years that saw the overthrow of the Shah's regime, the triumph of the Islamic Revolution, and the devastating effects of war with Iraq. The intelligent and outspoken only child of committed Marxists and the great-granddaughter of one of Iran's last emperors, Marjane bears witness to a childhood uniquely entwined with the history of her country. Persepolis paints an unforgettable portrait of daily life in Iran and of the bewildering contradictions between home life and public life. Marjane's child's-eye view of dethroned emperors, state-sanctioned whippings, and heroes of the revolution allows us to learn as she does the history of this fascinating country and of her own extraordinary family. Intensely personal, profoundly political, and wholly original, Persepolis is at once a story of growing up and a reminder of the human cost of war and political repression. It shows how we carry on, with laughter and tears, in the face of absurdity. And, finally, it introduces us to an irresistible little girl with whom we cannot help but fall in love. A "Time Magazine "Best Comix of the Year"
Wise, funny, and heartbreaking, "Persepolis is Marjane Satrapi's memoir of growing up in Iran during the Islamic Revolution. In powerful black-and-white comic strip images, Satrapi tells the story of her life in Tehran from ages six to fourteen, years that saw the overthrow of the Shah's regime, the triumph of the Islamic Revolution, and the devastating effects of war with Iraq. The intelligent and outspoken only child of committed Marxists and the great-granddaughter of one of Iran's last emperors, Marjane bears witness to a childhood uniquely entwined with the history of her country. "Persepolis paints an unforgettable portrait of daily life in Iran and of the bewildering contradictions between home life and public life. Marjane's child's-eye view of dethroned emperors, state-sanctioned whippings, and heroes of the revolution allows us to learn as she does the history of this fascinating country and of her own extraordinary family. Intensely personal, profoundly political, and wholly original, "Persepolis is at once a story of growing up and a reminder of the human cost of war and political repression. It shows how we carry on, with laughter and tears, in the face of absurdity. And, finally, it introduces us to an irresistible little girl with whom we cannot help but fall in love. "You've never seen anything like Persepolis-the intimacy of a memoir, the irresistability of a comic book, and the political depth of a the conflict between fundamentalism and democracy. Marjane Satrapi may have given us a new genre." I thought [Persepolis] was a superb piece of work, not only for the child's eye view-the developing child's eye view-of a society unknown to many of us in the west, and feared and suspected in proportion to being unknown.... Satrap has found a way of depicting human beings that is both simple and immediately comprehensible, AND is almost infinitely flexible. Anyone who's tried to draw a simplified version of a human face knows how immensely difficult it is not only to give the faces a range of expression, but also to maintain identities from one frame to the next. It's an enormous technical accomplishment." "I found the work immensely moving with depths of nuance and wisdom that one might never expect to find in a comic book. It's a powerful, mysterious, enchanting story that manages to reflect a great swath of Iranian contemporary history within the sensitive, intimate tale of a young girl's coming-of-age. I didn't want it to end!" "You've never seen anything like Persepolis--the intimacy of a memoir, the irresistability of a comic book, and the political depth of a the conflict between fundamentalism and democracy. Marjane Satrapi may have given us a new genre." --Gloria Steinem I grew up reading the Mexican comics of Gabriel Vargas, graduated to the political teachings of Rius, fell under the spell of Linda Barry, Art Spiegelman, and now I am a fan of Marjane Satrapi. Her stories thrummed in my heart for days. Persepolis is part history book, part Scheherazade, astonishing as only true stories can be. I learned much about the history of Iran, but more importantly, it gave me hope for humanity in these unkind times. --Sandra Cisneros, author of The House on Mango Street and Caramelo I thought [Persepolis] was a superb piece of work, not only for the child's eye view--the developing child's eye view--of a society unknown to many of us in the west, and feared and suspected in proportion to being unknown.... Satrap has found a way of depicting human beings that is both simple and immediately comprehensible, AND is almost infinitely flexible. Anyone who's tried to draw a simplified version of a human face knows how immensely difficult it is not only to give the faces a range of expression, but also to maintain identities from one frame to the next. It's an enormous technical accomplishment." -- Joe Sacco, author of Palestine and Safe Area Gorazde This witty, moving and illuminating book demonstrates graphically why the future of Iran lies with neither the clerics nor the American Empire. --Tariq Ali Author of The Clash of Fundamentalisms: Crusades, Jihads and Modernity "I found the work immensely moving with depths of nuance and wisdom that one might never expect to find in a comic book. It's a powerful, mysterious, enchanting story that manages to reflect a great swath of Iranian contemporary history within the sensitive, intimate tale of a young girl's coming-of-age. I didn't want it to end!" --Diana Abu-Jaber, Author of Crescent and Arabian Jazz "A rare and chilling memoir that offers every reader a personal, honest portrait of Iran's recent political and cultural history. Ms. Satrapi's provocative, graphic narrative of life in Iran before and after the Islamic revolution is an extraordinary testament to the level of human suffering experienced by Iranians tossed from one political hypocrisy to another. Aside from the humanistic dimension, the beautifully minimalist Persepolis gives further evidence of Marjane Satrapi's sensitivity and superb skill as an artist." --Shirin Neshat, visual artist/filmmaker "Readers who have always wanted to look beyond political headlines and CNN's cliches should plunge into this unique illustrated story. Let Marji be your trusted companion, follow her into the warmth of a Persian home and out along Tehran's turbulent streets during those heady days of revolution. Persepolis opens a rare door to understanding of events that still haunt America, while shining a bright light on the personal humanity and humor so much alive in Iranian families today." -- Terence Ward, author of Searching for Hassan Blending the historical with the personal is not an easy task, to blend the individual with the universal is even more challenging. But Marjane Satrapi has succeeded brilliantly. This graphic novel is a reminder of the human spirit that fights oppression and death, it is a witness to something true and lasting which is more affective than hundreds of news broadcasts.